Allow me to introduce myself; My name is Shirley Heard and I am the owner of Scrapbooks Forever here in fun and fabulous Branson Missouri. I bought the store from the delightful Pickle family in January 2011. I have been a stamper and scrapbooker for the past two decades, having taught classes for 13 years at Unique Impressions for Shirley Block. Many of you have taken classes from me, I’m sure. 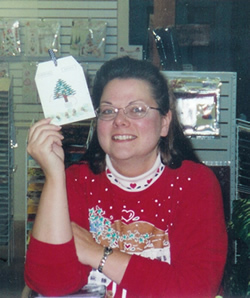 Under Shirley Block’s expert guidance, I also attended many a CHA show ( crafting industry trade show) taking classes myself from such icons as Tim Holtz. I will use all the knowledge I’ve gathered over the years to continue to provide you one of the best stores around. My husband , Troy, and I have lived in Branson for 33 years and have operated the Cedar Creek Dulcimer shop next door to Scrapbooks Forever and at Silver Dollar City. My husband will continue to run the dulcimer shop as I move on to the Scrapbook store, but you may see him from time to time helping me out. Fun Fact about me… I would wear pajamas 24/7 if it was socially acceptable. 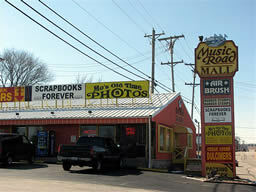 I look forward to meeting all of you and making your visit to Scrapbooks Forever fun and informative. Come and see me! We are located in the orange and yellow “Music Road Mall” between Presleys’ Music Theater and the Hollywood Wax Museum!